Welcome to our Bed & Breakfasts, the premium hotel alternative in Western Kentucky. Read the REVIEWS posted by our former guests and you'll conclude that you've found one of the finest of lodging options in Madisonville. Both the Hammack-Moore House Bed & Breakfast and Ruby Lodge at Spring Lake Woods offer our guests gracious style and historical and architectural interest unsurpassed in the area, along with the privacy, convenience, value and amenities that the business traveler expects, including flexible check-in, check-out and breakfast times and special rates for extended stays. Escape the everyday hotel and ask yourself..."Why just book a room, when I can book an experience?" Book yours today! NOTE FOR CLASS REUNION AND WEDDING ATTENDEES: We routinely block our guest rooms from online booking availability on event weekends to ensure that as many attendees can stay with us as possible to add to the fun and take advantage of our special event pricing. If you fit into this category and our online booking engine reflects that no rooms are available, please call us at 270-821-5812 to find out what is actually available...but hurry, rooms are first-come, first-served and we're booking fast! *Standard rates as published online for Madisonville,KY, as of 11/15/10: double-occupancy with single Queen or King Bed and private bathroom. Ruby Lodge at Spring Lake Woods is actually comprised of two estate homes offering a total of six guest rooms and extensive indoor and outdoor common areas. 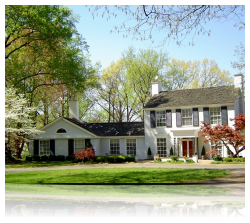 Although only three blocks from downtown Madisonville, the Bed & Breakfast is situated on 70 acres of park-like setting, complete with lake and outdoor pool and hydro spa to be enjoyed in warmer months. Given its serenity and natural beauty, the facility is ideal for weddings and celebrations of all types as well as off-site business and sales meetings...a unique find in Western Kentucky. 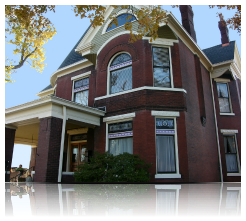 Centrally-located in Western Kentucky, The Hammack-Moore House Bed & Breakfast is conveniently located on Main Street in downtown Madisonville. The historic home offers five lovely guest rooms, a large wrap around porch for people watching on warm days and ample common areas loaded with period antiques. Given its proximity to downtown government offices, law firms and businesses along with spacious common areas, The Hammack-Moore House is an ideal lodging option for groups traveling on business.